← Dijon by train. The search for Wifi options continues. 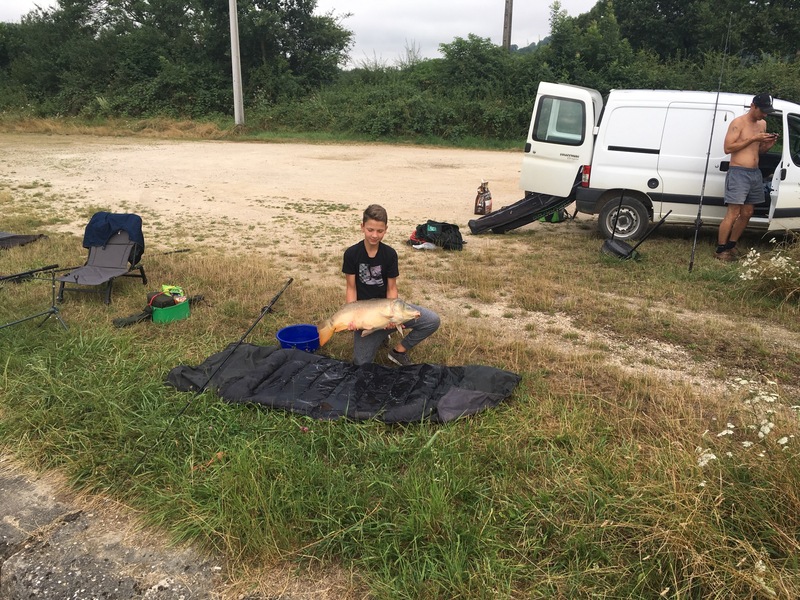 The morning was cooler when we woke in Pouillenay. We had agreed with the lockeepers that we would have a 9am start as we had 17 locks to ascend in only 6kms. Heavy workload and the mornings are cooler which is much more pleasant than slogging away in the hot sun. So we stayed on the boat eagerly awaiting their arrival. One did arrival but she was taking the hire boat back the way we had come so I asked her when we were leaving. She said the guy was coming on his scooter soon. Great! 10am. 11am. By 11.45 we gave up, knowing no one would come so close to lunchtime and so I wandered into the village for bread (there is a ‘depot de pain’ and the bread excellent). Two boats arrived at 12, one staying for the night and the other one, an Italian family, said they were going on at 1pm the same way as us. So did the Dutch boat in front who had arrived after us the previous afternoon. At this point I was thinking the lockeepers had forgotten about us. Would be all fit in together? The Italians said they were in a hurry but they were 3rd in line as far as I was concerned. Ok, so this is where it all turned into a cluster #%**. The Dutchman in front took control. He said he was going to open the gates to the lock and we’d all just jam in together and see if we could get the doors closed behind the last boat. This wasn’t really allowed as you’re supposed to wait for the lockeepers especially since the doors were closed. However off they went, up the front, we went in behind, missing our bow thruster as we had to almost touch the front boat in order for the Italians to get their boat in. They weren’t happy at all. But with a bit of rope adjusting and shunting we all squeezed in. Alan and I assumed we would now wait for the lockeeper but suddenly our Dutch friend decided to start opening the sluice gates with his vice grips. Words were exchanged on his boat but he did it anyway. Problem was he didn’t realise that water was still flowing out through the lock and into the pound behind us. This is controlled by a magic box and he had no access to it and without a key. So long story short (too late?) the outcome was that his actions started draining the pound in front and filling up the one behind much to the consternation of a fisherman who arrived, yelling and waving his arms around. So our friend closed the gates at both ends. There we were, three boats jammed into a lock and we couldn’t go up or down. And the sun was beating down. Where was the lockeeper? Tempers were fraying. I should explain at this point that we had Dutch, English, French and Italian voices all at once. (In retrospect highly entertaining). But luckily for us one of the girls on the Italian boat spoke quite a bit of English and some French. The Dutch people spoke a little French and some English and I speak some French and my English is excellent 🙂 We somehow managed to understand each other. Sometimes you don’t need words, do you? Arm waving is much more expressive! Finally a lockeeper showed up at quarter to 2. There were raised voices between the Dutch contingent and the lockeeper which is not surprising. Another lockeeper showed up, shaking his head and muttering. I caught the world “mêlée” meaning mess or scrum which was highly accurate. The pound in front was now very shallow but he did his thing with the magic box, sorted out the water levels and locked us through. We all motored carefully out, relieved the drama was over. So that was the first lock of the day! Now we only had 16 more to go! 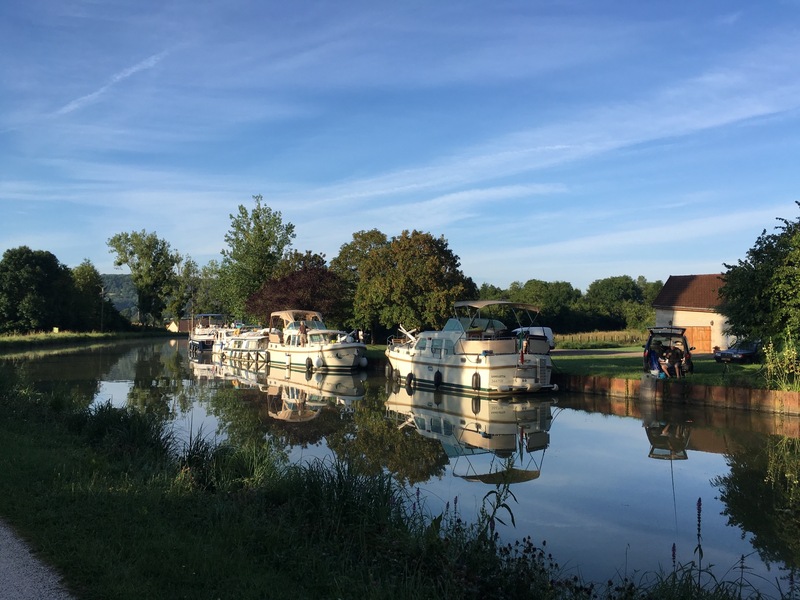 We plodded on until 6pm when we finally made Marigny which would have been a nice mooring except for the incredibly smelly overflowing rubbish skip right in front of the mooring. Lighting a citronella coil masked the stench. Alan had a drink with the Dutch people on their boat later on but I went to bed early, feeling very sore and exhausted from all that rope work in the hot afternoon sun. You can’t smell the decomposition from the bridge. Bonus. The next morning dawned a stunner. Cool and clear. I walked into the village for bread at 7.30 and we were ready to go by 8.45. And very pleasantly surprised to find our lockeeper ready to go at 9am. We all knew how to manoeuvre ourselves into the locks now, old hands after yesterday’s debacle and the morning went very well, 12 locks in total and we arrived in Pont Royal at 12.30, the lockeeper working through his lunch break to get us there. I am now back to being impressed with the VNF! 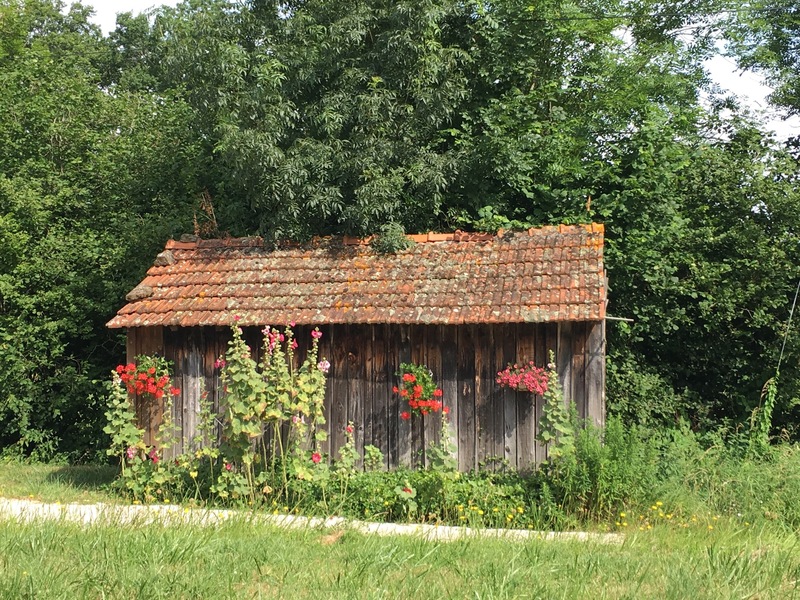 Can sheds be pretty? Yes they can. The lovely Pont Royal where €11 bought us power, water, 2 pain au chocolat and a baguette. Delivered. Bargain! The staircases of locks going up are nearly over. In total we will have climbed 113 locks and 300 metres to the summit and on the way down we will drop 199 metres and pass through 76 locks. 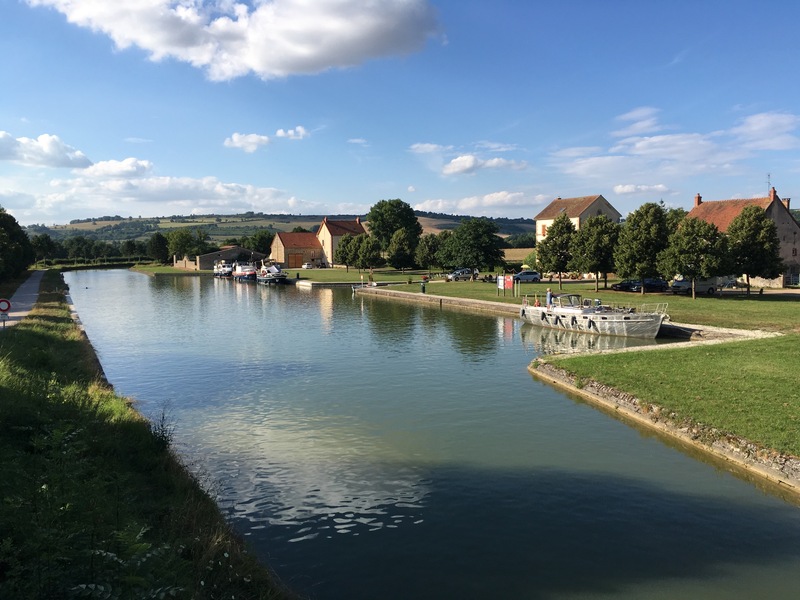 This canal is 242 kms long (one of the longest watershed canals) linking the Yonne to the Saône. It’s epic and exhausting but so worth it. 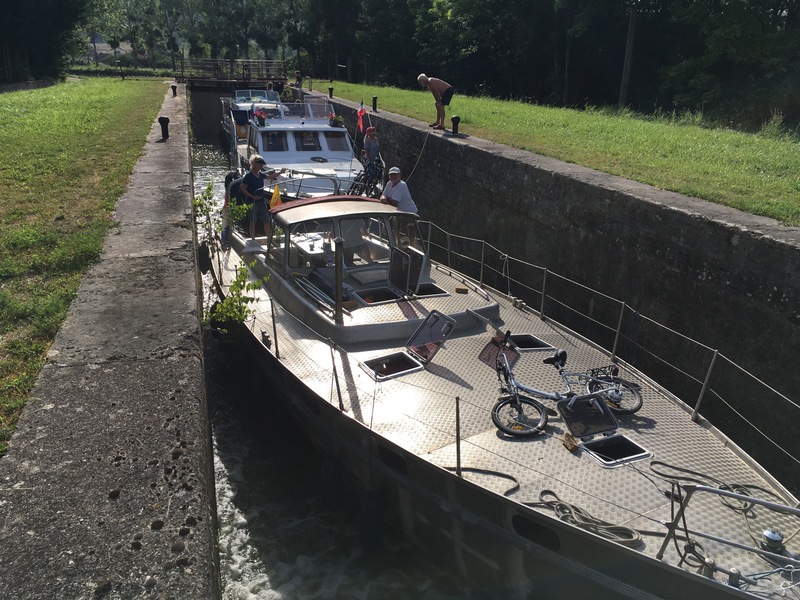 This entry was posted in Burgundy, Canal boat, Canal de Bourgogne, France, French Canal boating, Holiday 2016, Marigny, Speaking French and tagged burgundy, Canal boating, Canal de Bourgogne, Canal locks, eclusiers, Marigny, Pouillenay. Bookmark the permalink. So true. Never a dull moment!